On Saturday, July 7th and Sunday, July 8th 2018, the Ouachita Parish Sheriff’s Office is hosting a Glock Match Shooting Competition. The match is sponsored by the Glock Sport Shooting Foundation program. 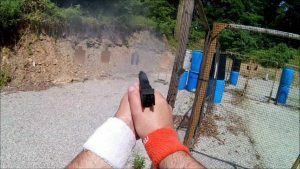 The course is simple and is great for beginning shooters. The total course consists of 3 stages of fire. Each shooter is required to furnish their ammo and must shoot the course with a Glock pistol. Seventy-eight rounds of ammo will be the minimum required to complete the courses. The shooter will not need a holster as you will start from the down ready position. For more information on the course of fire click the link below. You can avoid the walk up lines at the match and pre-register by clicking the link below and follow instructions on the registration form, or visit http://gssfonline.com/index.cfm and retrieve it. To shoot the match, the shooter pays a $35 Glock membership fee and $25.00 per course of fire. You can follow directions listed to fax or email the form to Glock by noon on Wednesday, June 5th. If you miss the deadline, retrieve the form and bring it with you the day of the match. If you need more information, contact the Ouachita Sheriff’s Rifle Range at 318-410-2427. We encourage anyone interested to participate as this match has been a tremendous success in the past. The Ouachita Sheriff’s Office hosts several events during the year that may interest you as well. We encourage you to visit the calendar on our website at www.opso.net for dates and information concerning other OPSO sponsored events at the range during the year.